Numbers can be tricky especially when the alphabet is involved! Problems, equations, formulas may seem complicated for a student to understand and challenging for a parent or teacher to explain. 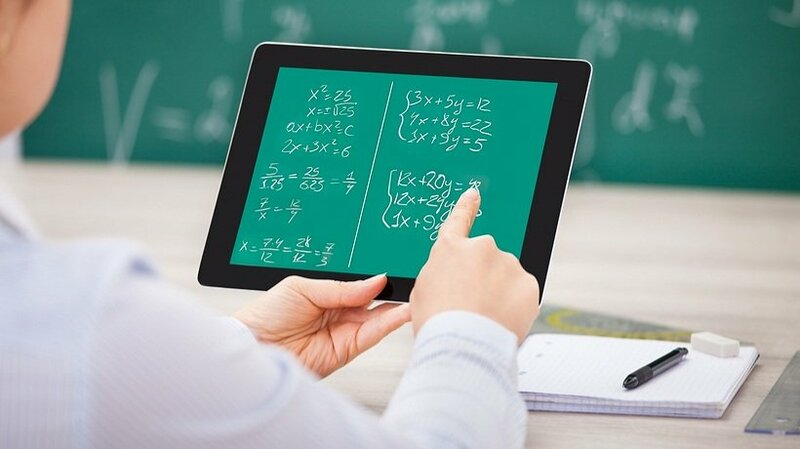 In the following list you will find 15 Free Algebra Applications for iPad and iPhone, perfect for teaching and practicing, for home or school use. Algebra Champ provides practice solving straightforward, single variable linear equations in an entertaining, game-like environment. Questions are randomly generated and presented in rounds of five. Answers are manageable integers (-10 to 10) and presented as multiple choice.Play a few rounds each day and you'll quickly gain an increased comfort level with entry level algebraic expressions, negative integers, and quick mental calculations. Easel combines interactive, hands-on Algebra workbooks with instant "ShowMe" lessons. If you get stuck on a problem, just tap "ShowMe" and see a step-by-step animation of how to solve the problem, instantly. It's like having a tutor on demand! This apps is designed to allow students to learn about the rules of exponents. The purpose is that this app will be a resource in the learning of exponent rules. HMH Fuse Algebra 1 Common Core Edition gives every student a personalized learning experience using video tutorials, MathMotion step-by-step examples, homework help, quizzes, tips, hints, and many other integrated features to teach, review, and assess all concepts. This app was designed in order to help Jr High students with their algebra skills. The app contains lessons, videos, sample questions as well as randomized screens where practice work can be done. The app will also allow students to input answers to see if they are correct and on the right track. Khan Academy Algebra allows students to learn Algebra through various videos which are downloaded directly on your Iphone or Ipod touch and in the future to your Ipad. Students can watch the video anywhere, anytime, all the time and NEVER be concerned about having access to the internet while you are going through a Khan Academy lesson. Khan Academy Algebra allows students to learn Algebra through various videos which are download directly on your Iphone or Ipod touch and in the future to your Ipad. Students can watch the video anywhere, anytime, all the time and NEVER be concerned about having access to the internet while you are going through a Khan Academy lesson. Khan Academy PreAlgebra allows students to learn PreAlgebra through various videos which are download directly on your Iphone or Ipod touch and in the future to your Ipad. Students can watch the video anywhere, anytime, all the time and NEVER be concerned about having access to the internet while you are going through a Khan Academy lesson. Ooops presents a series of such problems that are solved by placing one or more sets of parentheses on the right side of the equation to make it equal to the number on the left. At any point the player can check their work by pressing the check button to see how their parentheses have changed the result. This will show them the steps of the problem as the operations are performed in order. Need some help in algebra? Then this app is right for you. This app will swiftly solve your math homework with ease, showing you all the steps along the way. Don't worry about having to have an internet connection because this app doesn't require one. This app was designed to help Jr High students work with polynomials. With the information presented there are videos to help explain all the concepts needed to be successful with polynomials at a Jr High level. Proportion Solver solves proportions, which are equations with two ratios. Enter a complete ratio and then a value for the numerator or denominator for the other ratio and Proportion Solver will complete the incomplete ratio. Proportions are useful for converting values based on relationships (e.g. width/height, Fahrenheit/Celsius, weight/height, mph/meters, U.S. dollars/Euros, pixels/inches, etc.) and are frequently used in high school and college level courses. Shuttle Mission Math is a mathematical puzzle game that makes algebraic thinking both visual and interactive. The goal is to find the weight of each space creature and assemble a team for the next shuttle mission. Intended for ages 10+. “Boss 'T' Maths - Special Binomial Products" is a math teacher creation. This app is meant to help understand and revise special binomial products. It can be seen as an interactive course to use either at school or at home.